Here’s a recipe from six years ago that is a delight for Super Bowl entertaining. 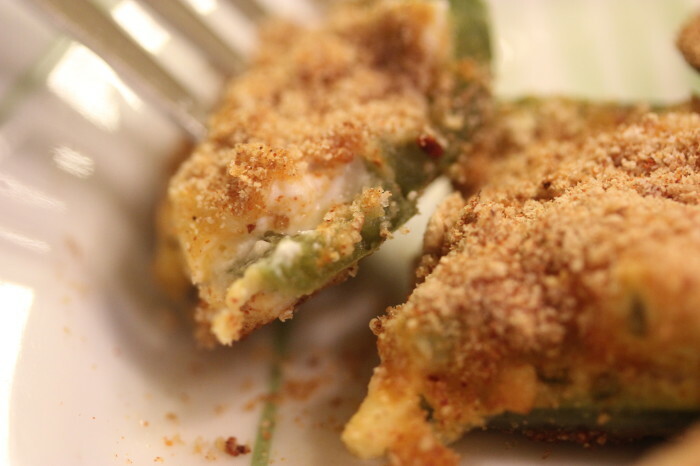 As you’ll see, my wife and I have had jalapeno popper discussions. This was my way forward, given her adversion to fried food. These poppers are what you want: hot, gooey, and comforting. You can bake up a batch, kick back, and enjoy Super Bowl LIII. It’s tricky. If I appear to be acting with intent, she’ll smell it out, her suspicions will rise, and I’m screwed. “No,” she cut me off. There’s an old radio show that begins with: “Who knows evil lurks in the hearts of men. The Shadow knows.” So does Suzen. I wanted to try the jalapeno poppers. I love them. Yes, they are deep fried. No, deep frying was not invented by the American College of Cardiac Surgeons. But they might have. There are ways to deep fry with care and kinda healthfully. But my menu was at one of those upscale, chain but still fast food restaurants. The way they deep fry is not a passage to reaching something approaching old age, like 50. But, but, now, I have a solution. I can satisfy my craving and do with poppers baked and not deep fried. These are the epitome of what evil was meant to be. Hot, gooey, and the perfect complement to a margarita. This recipe is from Fresh by Better Homes and Gardens. Fresh has just been published and it’s prominently displayed in the New Cookbooks section of my Barnes and Noble. It should be. I’ll cover more about this wonderful book tomorrow, and there will recipes from it appearing throughout the year. That’s the great thing about Fresh. The recipes are organized not just by course [appetizer, main dishes, …] but also by season: Spring to Winter. The intent here is to make a great dish from what is currently, locally available. That’s the mantra we all hear. We know that we should do it. How do we do it? Simple: get a copy of Fresh. This recipe is just my style. It’s great if you follow it to the letter. But there are obviously ways you can play with it. Panko? I used spiced bread crumbs instead. Just ⅛ teaspoon of paprika? I like paprika so it was 1 full teaspoon. Play at will here with amounts and different add-ons. They are all going to be mushed into melted cheese anyway. Oh, I did not use regular cream cheese: it was scallion and chive. Gee, and I was wondering where the heat came from. Maybe I’m not so smart. Maybe I’m never going to outwit my wife again, ever? Preheat an oven to 350⁰. Cut the jalapeno peppers in half lengthwise. Remove the seeds and membranes. In a bowl, combine the cream cheese, scallion, and cheddar cheese. In another bowl, combine the bread crumbs and all the spices. Fill the pepper halves with the cheese mixture. You want to fill them level to the edge of pepper — which means you want “big” jalapenos that will have some depth to them. Drizzle the beaten egg over the jalapeno halves. Sprinkle with the spiced bread crumb mixture. Place on a baking sheet lined with foil. Bake for 20 to25 minutes or until the cheese begins to ooze out.